Saudi Arabia's Crown Prince Mohammed bin Salman was sidelined during the official "family photo" of world leaders and other dignitaries at the Group of 20 summit in Buenos Aires yesterday, standing at the far edge of the group portrait and ignored. Prince Mohammed's presence at the international summit has been contentious following the killing of Saudi journalist Jamal Khashoggi at a Saudi consulate in Istanbul in October. At centre stage was Argentine President Mauricio Macri, hosting this year's summit of G20 industrialised nations. Mr Macri has said accusations that Prince Mohammed was involved in Mr Khashoggi's death could be discussed by world leaders during the two-day gathering. Saudi Arabia has said the prince had no prior knowledge of the murder. French President Emmanuel Macron told the Prince that Europe would insist on international experts being part of the investigation into Mr Khashoggi's murder. In a five-minute exchange on the sidelines of the G20 summit in Argentina, Mr Macron conveyed "very firm" messages to the prince over the killing and the need to find a political solution for the situation in Yemen, an Elysée official also said. The 'Saudi Gazette' newspaper posted video of the meeting online, showing the two speaking in hushed tones with their heads close together, Mr Macron looking the crown prince in the eye and Prince Mohammed nodding his head and at times smiling. In the audio, it is possible to make out the prince saying "Don't worry", to which Mr Macron responds, "I am worried". Later in the one-minute clip Mr Macron says, "You never listen to me" and the crown prince replies: "I will listen, of course." At the end Mr Macron can be heard saying: "I am a man of my word." The Elysée said it was the first time the French president and the crown prince, known as MBS, had spoken since Mr Khashoggi's murder at the Saudi consulate in Istanbul on October 2. Mr Khashoggi, an opinion writer for the 'Washington Post' who was at one time a Saudi royal insider before becoming a critic of the leadership, was killed by lethal injection and dismembered by a group of Saudi men sent from the kingdom. Saudi Arabia's public prosecutor has said MBS knew nothing of the operation to kill Mr Khashoggi. Mr Macron's office said the meeting with the crown prince was justified because European nations wanted to send a united message about the need for probity in the investigation and were not going to sidestep an opportunity to reinforce that message during the G20. "We were not going to play hide and seek for 48 hours, it wouldn't make any sense," the official said. "If we're here and he's at the table, let's be frank and not indulgent. Things that need saying will be said." Earlier, the Elysée said the video showed "a sort of contrast between MBS's face sporting an embarrassed smile and the (French) president's face, which was rather stern, and was keen to convey these messages in a very firm manner". 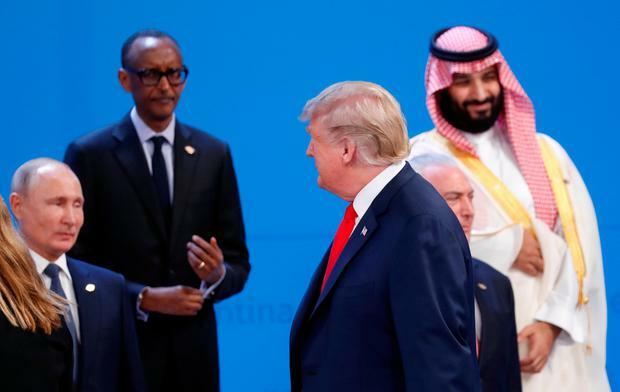 Overall the exchange appeared cordial, with Mr Macron attempting to get his point across, speaking with his hands in front of him and looking MBS in the eye. MBS nods repeatedly and appears accommodating and somewhat apologetic.